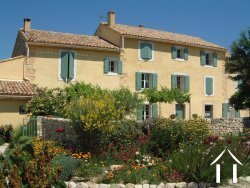 Provençal mas in stunning location at only 15 minutes away from the lively town of Isle sur la Sorgue. A few years ago, the property has been completely restored in a sustainable way respecting the many authentic features. Recently the property was used as a B & B ( 5 rooms and 1 "gîte"). Under the same roof as the guests accommodation, but completely separate, is a spacious house with 3 bedrooms and an office. 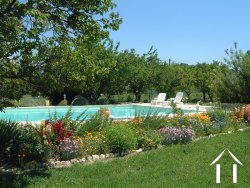 Beautiful flat and landscaped garden (7000 m²) with numerous fruit trees, a courtyard, a quality pool with an electric security shutter, "jeu de boules" pitch , etc .... At various locations in and around the house , one can enjoy a magnificent panoramic view of a Provençal landscape and the Mont Ventoux Mountain.